Catching shoplifters: It’s the most basic part of an LP pro’s job. Or is it? These days, it’s all too easy to focus on a simple crime like shoplifting as the culprit in retail shrink. But that’s a costly attitude, as the percentage of shrink due to nonprofessional shoplifting continues to drop while organized retail crime continues to rise. It’s also dangerous. Apprehension is becoming increasingly violent, and with those shrink percentages dropping, and most merchandise retrieved in an incident worth relatively little, it hardly seems worth the risk to grab a bad guy. So what should a modern LP pro do about shoplifting? The answer is in LP Magazine’s FREE Special Report, Issues with ORC and Shoplifting. The problem is that there’s so much more to shoplifting than stopping a thief on his or her way out the door. Organized retail crime, from simple return fraud to highly organized booster bag groups, is a much greater threat to your company’s bottom line. That’s why this free report covers it all: the data, the ORC strategies and the tactics used successfully against it all. I know you’re dedicated to stopping the bad guys, and this is your chance to enhance your knowledge and skills. Seize this opportunity and download this free report. 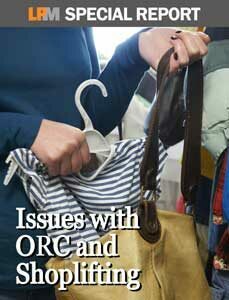 Enter your email and we'll send a link to the Issues with ORC and Shoplifting Special Report right to your inbox.